September welcomes the first arrivals of wintering geese! As the nights draw in and with a cold nip in the mornings, it’s a timely reminder that thousands of wintering geese will soon be with us…in fact, we’ve already heard about the first arrivals to the UK! 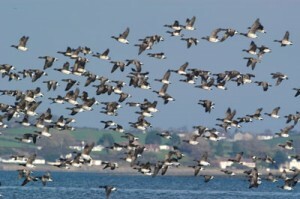 WWT Castle Espie reported the first fall of Canadian Light-bellied Brent Geese on 6th September, with 250 seen from the Brent Hide, and by 9th September nearly 3,000 geese could be seen at Strangford Lough. Pink-footed Goose flocks have been sighted in Scotland with Aberlady Bay seeing the first 157 on 8th September, and Reserve Manager Tom Clare at WWT Martin Mere reports that over 1,700 Pinkfeet are now back on the reserve. Pinkfoot flocks have also been reported at sites in Norfolk, and the first Dark-bellied Brent Geese have also reached our shores. With recent catches of Canadian Light-bellied Brent Geese taking place on their breeding grounds this summer, and catches of Pink-footed Geese having been undertaken last winter, it’s worth looking out for any colour-marked birds. Information on how to report a colour-marked bird can be found here.